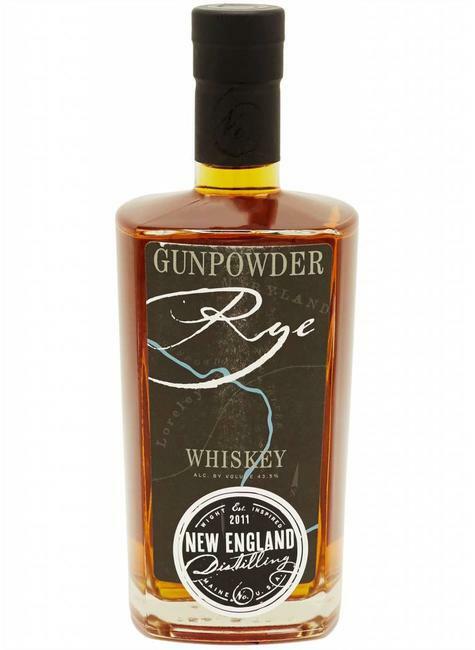 Gunpowder is a spicy Maryland style rye with toasted malt flavor and big barrel character. The finish is long with vanilla and chocolate notes. Gunpowder Rye Whiskey draws its inspiration from our rich heritage of rye whiskey production: brewed from local grains and distilled in small batches on our traditional copper pot still. At the heart of New England Distilling is a custom designed, hand-made copper pot-still. The design of the still allows us to produce robust whiskeys and rums alongside clean, crisp gin. The still is heated with direct fire which creates more caramelizing reactions in the pot leading to a more complex, robust spirit. The spirit leaves the pot and passes through two thumpers, driving the proof up and picking up “flavor compounds on its way to the worm where it is cooled and condensed back into a liquid. The spirit is collected as it leaves the worm, and matured in oak barrels or, as with our Ingenium Gin, allowed to rest a while and get its wits about it before bottling.